How many summers do you get to spend with your children? Facebook gifted me a good read the other day so I wanted to share. From one blog to another, it's fun to stumble across something special. The piece emphasizes that we get 18 summers with our children before their endeavors or experiences take them elsewhere. My initial thought was to dismiss it as dramatic, but I know better. Every morning I stare at my three year old in disbelief. Time is flying. This is the summer of "let them be little and let me be present." 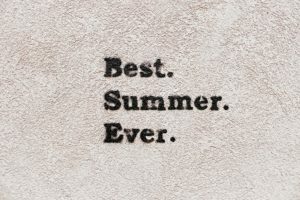 We're rooted in simple pleasures, which makes local fun appealing, affordable, amd perfectly atune with my summer slogan. Let's begin with my love of Thursdays. The Farmers Market is beyond family friendly and I've got a toddler who thinks pickle on a stick for a dollar is the best bargain in town. Seriously, the vendors are incredible, the live entertainment talented, and the crowd pleasant. It's a family favorite. I have a growing obsession with our local library. Having lived a lot of places in a short amount of time, I've been witness to many library programs and environments. I'm thrilled that our library has a summer reading program for all ages and emphasizes the family reading experience. The summer reading kick-off is June 18th from 3:00-5:00 p.m. There's a wide variety of activities scheduled throughout the event, which concludes with a magic show at 5:00 p.m. The Madison Pool officially stole my heart on opening weekend. There's something about this place that feels like it's from another era. The baby/toddler pool and playground is sure to be the backdrop of numerous memories and laughs. I eagerly anticipate all that this facility has to offer. I'm ready for bubbles, chalk, sandboxes, and everything summer. Whether it's at Dodge Field, the pool, library, Farmers Market, or strolling throughout town, these simple summer days mean everything to me. Too often I'm focused on the schedule, afraid of the meltdowns, or overwhelmed by the unending energy of my little ones. But all of this is natural and not to be feared or overthought. I'm the maker and maintainer of their summer fun. I'll let them be little. This is me vowing to be present. I'll put the phone down, kick off my shoes, let the grass graze my toes, and take a deep breath in. These are the days I'll soon miss.